Metropolis is being attacked by the giant villain Brimstone. Supergirl shows up to help, but is unable to subdue him. Martian Manhunter changes from his civilian identity and lends a hand. On New Krypton, Superman meets his new brother Prym-El. Brainiac is there also. Back on Earth, Martian Manhunter does his best, but is thrown down by Brimstone, due to his weakness to fire. Wonder Woman shows up, and lasso's Brimstone, but he just melts right through. Just then a Giant Octopus grabs Brimstone, and throws him into the Ocean, Aquaman shows up and everyone thanks him for bringing the octopus. On New Krypton, Zod and Brainiac trap Jor-El, and send his spirit into the Fortress of Solitude. Superman comes looking for his father, only to have Lara freak out, as she explains that Prym-El has grown Several years in moments and calls himself Superboy Pryme! Lastly on Earth, Lex Luthor talks to his mysterious friend, that turns out to be Darkseid. They monitor the growth of Superboy Pryme. Story - 4: I found this issue a little childish, when it came to the action on Earth. But then again, it is aimed at the younger audience. I'm still enjoying the New Krypton, Brainiac, Lex Luthor and Zod stuff. I really think this is a lot better of a concept that what World of New Krypton gave us so many years ago. 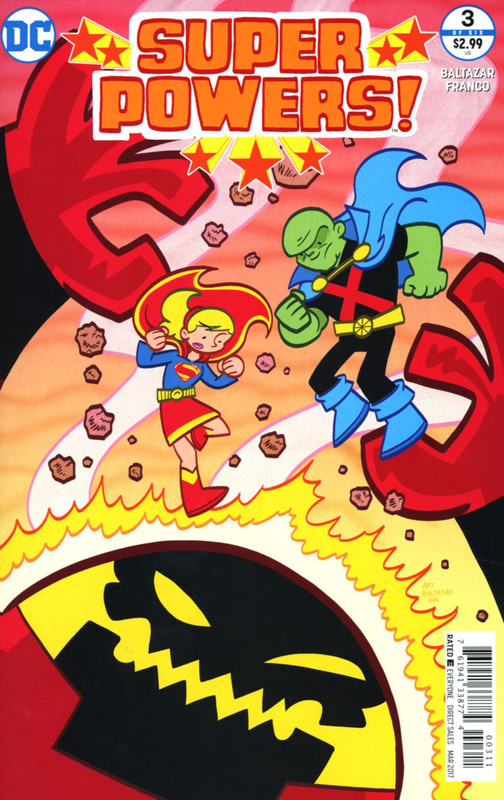 I liked this version of Martian Manhunter. It was fitting to see that he came to help Supergirl, echoing the TV show a little there. Art - 5: 'm enjoying the simplistic, Hanna Barbera look of the art. More so, I really like some of the designs that have popped up out of this. Mainly Martian Manhunter's classic look, with a black colored bodysuit underneath. Good work again there team. Cover Art - 5: I like the cover very much. Good composition.